Jammu Tawi is a railway station located in Jammu city, Jammu and Kashmir state, India. Jammu Tawi is also known to be the largest railway station in the state of Jammu and Kashmir. It is a primary railhead for many other site in the state. It makes for an important site for tourists heading towards the Kashmir Valley. Kashmir Railway project starts northwards. It is situated in the Firozepur division of Northern Railways. 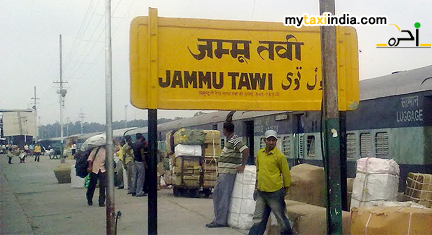 The railway station of Jammu Tawi is well connected to all major cities in India by Indian railways trains. Jammu is one of the three major administrative divisions situated within Jammu and Kashmir. The place is visited by thousands of people each year from around the nation and abroad for amazing tourist destinations. Bahu Fort built by Raja Bahulochan is among the most popular sightseeing attractions of Jammu. It was constructed about 3,000 years ago. Nandini Wildlife Sanctuary is dedicated for wildlife enthusiasts and home to various species of pheasants. Sanasar is among the major attractions situated at a distance of 19 km from Patnitop. It is also referred to as mini Gulmarg. Amar Mahal Museum is a palace was built by King Raja Amar of the Dogra Dynasty. Shiv Khori is a crucial cave shrines of Jammu famous for natural formation of a shivalinga. Bagh-e-Bahu is a scenic garden laid identical to Mughal Garden. Other important tourist attractions in Jammu include Mubarak Mandi Complex, Dogra Art Museum, Bahu Temple, Raghunath Mandir, and many more. Hiring a taxi in Jammu will help you enjoy the tour better. The key to an efficient Railway Transfer and Car Hire service is timely offering of updated info and assurance for comfort to the customer. At My Taxi India, we emphasise on combining modern technology and communication facilities to guarantee timely services for departure as well as arrival train services.